The photo to the right is one of my life’s jackpots. 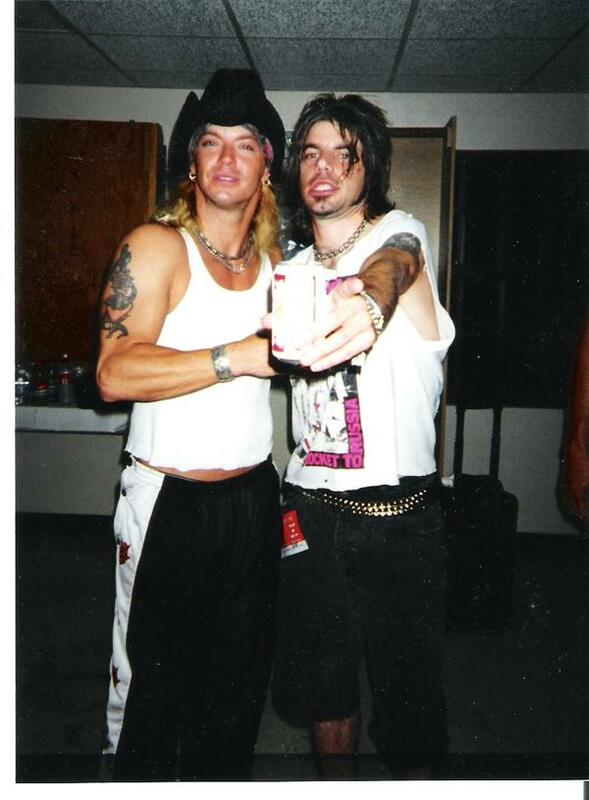 Snapped backstage in 2000 at San Antonio’s Sunken Garden Theater, the image captures Poison singer Bret Michaels and me exiting the stage just seconds after we sang the KISS anthem “Rock N Roll All Nite” in front of a few thousand of my fellow hometown rockers. This all went down because I did a phone interview with Bret a year earlier and was told by his publicist that he loved the resulting article. When Poison returned the following year, Bret’s publicist called again to arrange for a repeat interview and article. Not a problem. As that interview wrapped up, Bret said he would invite me onstage in San Antonio to experience the rock-n-roll thrill ride he enjoyed every night. “You’re a KISS fan, right?” he asked over the phone. Sure, I said. “We close the show every night with ‘Rock N Roll All Nite,’” he continued. “I’ll leave passes for you and call you up on stage.” Um, yeah. Whatever, dude! The night of the gig, drummer Rikki Rockett starts pounding out the familiar intro to the KISS classic. As promised, I had the passes Bret left for me, but figured they were just a nice gesture to get me into the aftershow meet-n-greet. Plus, I was on empty and needed another beer so I wasn’t gonna press my luck. As the drums brewed to a boil, Bret called my name from the stage. The jolt was like sticking a knife in a toaster. Then he yelled my name a second, third and a fourth time as the crowd’s whooping swelled to a roar. Dumbstruck with adrenaline, I bolted through the audience and up the side-stage stairs. Yelling “It’s me! It’s me!” as I flashed my pass and dodged security, I finally skidded onto the stage and landed nose-to-nose with Bret just in time to share his mic as the vocals kicked in. Bret was wild-eyed and grinning. I was dancing like a monkey. Meanwhile, my best friend was being escorted from the venue for “watering the trees” and missed the entire spectacle. Great! Back on stage, I played air guitar alongside C.C. DeVille. I climbed the drum riser. I shared backup vocals with Bobby Dall. I was the king of the nighttime world … at a time when cell phone videos were painfully scarce. Damn! This fans-on-stage thing became part of Poison’s show in subsequent years, but to be singled out as a solo guest, was extremely uncommon and special at the time. It was an electric moment from the other side of the microphone and is still one of my favorite stories. Over the next 10 years, Bret left open invitations for me at every Texas Poison gig so we could reunite for backstage beers and rowdy tour bus parties. Say what you will about his music, bandanna and reality shows, but Bret has always treated me like a king and I’ll never forget the hospitality. He is definitely one of the most appreciative rock stars on the planet and there’s no denying he loves his fans. Good story! This happened to me once, but it was a mariachi band. And it was at my cousin’s wedding. I was there and remember seeing you there on stage. Awesome show. My buddy and I got to meet the band as they loaded their bus. Poison was cool enough to sign my cd sleeves and take pictures.